In any program there are a number of expectations program managers should have of different stakeholders. 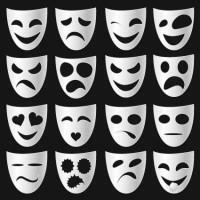 This article will further detail the roles of the main program actors. I will start with the different roles as defined in the PMI’s The Standard for Program Management (2nd Edition, 2008) and in the OGC’s Managing Successful Programmes (2007). The table below is my own summary of the descriptions that can be found in these two publications. It compares terms and roles between the two and outlines both similarities and differences. For the PMI, the executive sponsor plays a dual role of champion and responsible for benefits realisation; MSP defines two distinct roles: that of a sponsoring group to champion the program, and that of an individual to embed the capabilities into the business. 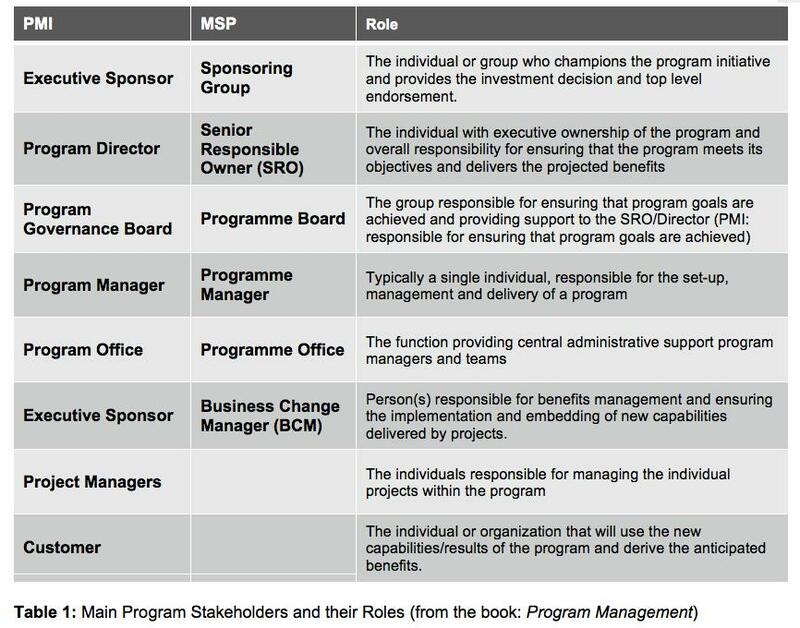 The PMI attributes the responsibility for achieving the program goals to the program governance board, whereas the MSP attributes it to the senior responsible owner (SRO). Reality shows that both are applied and that the choice of one or the other depends on the delegation of authority in the organisation and the seniority of the SRO/Director. In MSP, the program board is appointed by the SRO who has full authority over it. I have separated the business change manager (BCM) and customer although they would have a similar role. MSP seems to mostly consider the BCM’s role as that of an internal customer, whereas PMI sees the customer more as external, having only a needs definition and an acceptance of the program’s outcome function; for PMI, the transition is mostly seen as formal contract-based activities. Finally, the project managers are described as stakeholders only in the PMI Standard. MSP attributes the responsibility of appointing the project managers and the authority over them to the program manager, which I agree with. If this authority does not clearly exist, it becomes very difficult to effectively run the program. Program management is a flowing, cyclic process where the different actors are expected to collaborate towards that achievement of common objectives. 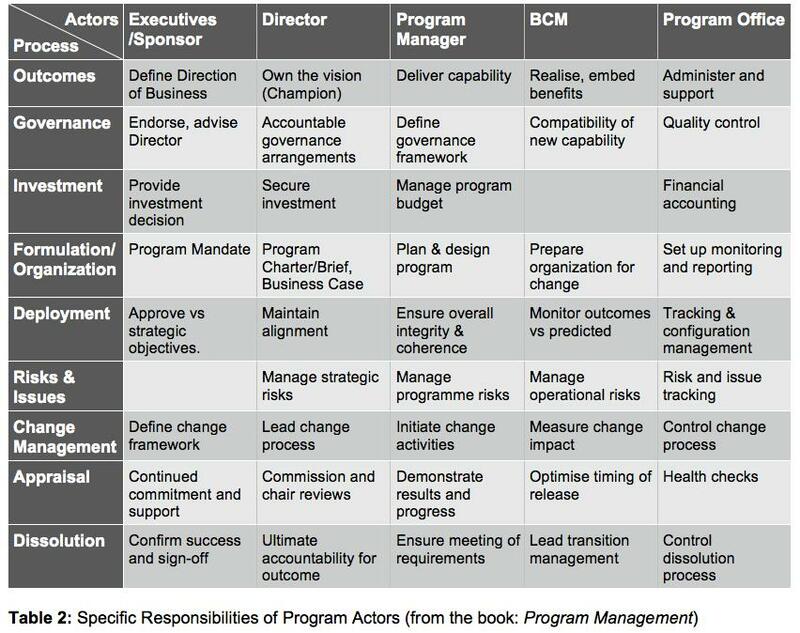 In the table below, I have identified some of the key roles of the program actors as well as some of the main areas of responsibility and aimed to create a horizontal flow between actors for each of these areas of responsibility. In mature organisations, it is the program manager’s responsibility to write the project charter and to appoint project managers and the project manager’s responsibility to deliver the results outlined in the project charter or brief within the parameters that have been set. The program manager also has a responsibility to secure the necessary resources to achieve the project objectives within these parameters. Project managers within a program also have a responsibility to coordinate their deliverables with other projects when two or more projects have interdependencies. My own experience shows that this is probably the most difficult aspect of managing projects within a program. It is the role of the program manager to identify these dependencies and make sure they are achievable. Operational and technical users will have a responsibility to clearly identify their needs and requirements, but also to take into account their achievability in regards of the whole program. They are expected to inform the program manager or the business change manager of any change or new development in those requirements and must be able to justify the need for change. They also have a responsibility to support the transition of project results into operations and alert the program manager or the business change manager of any discrepancies or roadblock to this transition. Whether you are an executive, a sponsor, a user, a program or project manager, guides and standards can be useful, but it is your responsibility as a program stakeholder to understand what your role in a program is and how program management can help your organisation achieve its objectives. Program management education – where are we now?